...Africa Fashion Week Nigeria a social enterprise that provides a platform to help promote Nigerian and brands through worldwide visibility and distribution and manufacturing. We focus on empowerment, creating jobs and supporting education and skills training in fashion. Venue: -The Eko Hotel & Suites. 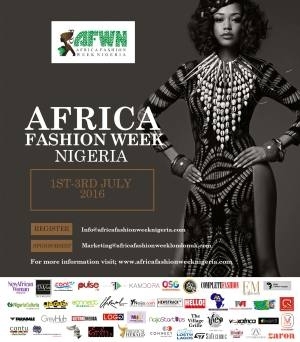 AFWN 2016 Will Include 5 Catwalk Shows | 50 Designers | A Fashion Gala & Awards Night & Panel Discussions Aimed At Promoting Nigeria As A Production Hub. SATURDAY THE 2ND OF JULY – (EXHIBITION opens at 12 noon)….FREE ENTRY.